The wife asked me if I wanted a glass of wine immediately as I passed through the door last night. Neither of us is a wine person, so I was surprised by the suggestion. Of course I replied no. I knew she wouldn’t ask for a beverage if she really didn’t want to share something, maybe just for the sake of sharing a conversation over a glass. Thinking quickly, I headed for the cellar (of course that is the basement) for a bottle of something wild. The wife has always appreciates something from Russian River Brewing Company. What better than a bottle of Supplication. Popping the cork, as quietly as possible, the snifter pour, when presented to my wife, surprised her. A huge smile was all I needed to know that the beer hit the spot. The tart cherries lead this beer, making it very enticing. The tart mix with the dry finish keep bringing you back until the unfortunate end of a 375ml split bottle. I believe I have another bottle left. I don’t think they ever last long enough to be “aged”. I am sure the last one will meet a similar fate. Enjoy! Useless Fact: If one places a minute amount of liquor on a scorpion, it will instantly go mad and sting itself to death. Valentine’s Day means I have to find a beer that the wife will like as well as myself. This makes choosing a beer a bit more difficult. 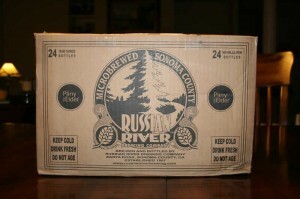 Luckily I have some Russian River Brewing Company beers in the cellar. My eyes quickly settled on a bottle of Sanctification. We have shared several bottles in the past, so I know this would be a great post-dinner beer: slightly tart, a touch of barnyard, and light. Perfect. 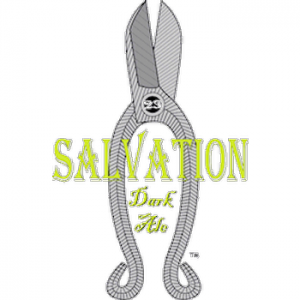 I had Sanctification back in May of last year as part of 365 American craft beers in 365 days. It never lets me down and aging only creates more complexity. The last two bottles will continue to age. The only problem I will have is allowing the beer to do so, there are many times that I see the corked bottles, having to pull my attention in another direction. Enjoy! Useless Fact: A cockroach can live several weeks with its head cut off. The common house fly cannot survive in Alaska. It is too cold. Those that do appear there are brought in by boat or plane and perish without reproducing. Mosquitoes, on the other hand, love cold weather. Specimens have been found near the North Pole. 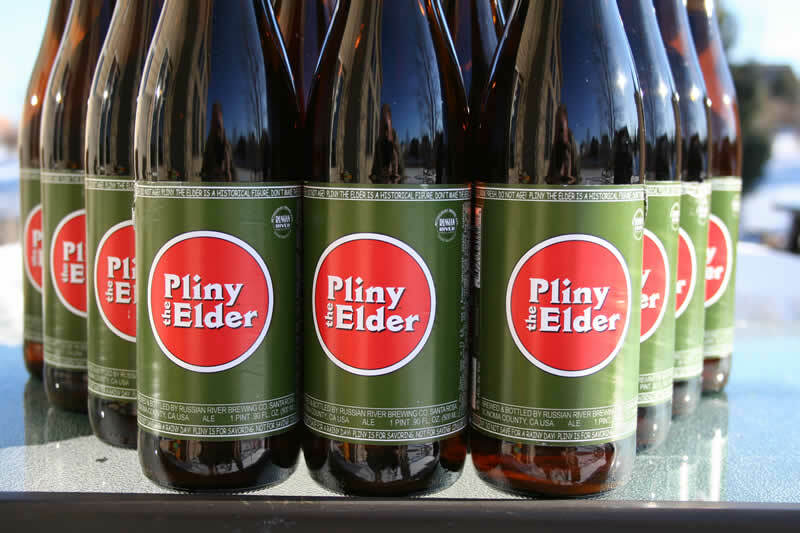 Russian River Brewing Company has created another fantastic beer. This time around it is Temptation another American Wild Ale. The delight in this American craft beer is the subtleties of the complex aromas and flavors. Temptation is easy drinking and refreshing. Even though it is light there is an strong carbonation that adds to the drinkability. Enjoy! Useless Fact: There are almost 6 million red blood cells in a cubic millimeter of human blood. The entire body contains about 30 trillion red blood cells. When a person inhales several breaths of carbon monoxide, more than half of the blood’s hemoglobin combines with the gas, leaving only half the red blood cells to carry oxygen. This has the same effect on the body as a sudden loss of 50 percent of one’s red blood cells. Fifteen million red blood cells are produced and an equal number are destroyed every second. Continuing my week or so of American craft beers obtained via transactions, Blind Pig IPA by Russian River Brewing Company graced my glass. Not the first time I have had this beer but something seemed to be off. Let’s not jump to conclusions, the beer was tasty, it just that it wasn’t as aromatic or tasty as I remembered from past experiences. Of course I had to figure out why. I started looking at the American craft beers that I have been grading or just having in general: all big IPAs. My taste buds this past few days has seemed subdued: none of the IPAs that I have revisited from past experience have been as robust. The aroma and taste just seem to fall flat. I know that IPAs can pummel the taste buds and I am thinking that repeated abuse in a short period of time has allowed them bounce back. Unfortunately tomorrow is going to be more of the same with Rich, so we shall see. Enjoy! Useless Fact: The short-term memory capacity for most people is between five and nine items or digits. This is one reason that phone numbers are seven digits long. Useless Fact: The name of the first airplane flown at Kitty Hawk by the Wright Brothers was Bird of Prey. The maiden flight of the Bird of Prey, however, was less than a flight—the plane stayed in the air only long enough to sail 59 feet. Father’s Day! Probably my favorite day of the year to celebrate myself as I get treated like a king around the house. How else should a king act then to appreciate the fine confines held with a bottle of American craft beer. It didn’t take a long look at the cellar to make it apparent that something from Russian River Brewing Company would have to grace my glass. I had never had Salvation before. With it staring me right in the eyes, how could I resist? Salvation, a Belgian Dark Strong Ale, was full of candy sugar, yeast, spice, dark fruits, and the burn from alcohol. Usually Russian River beers are very well kept in hiding alcohol levels but I thought Salvation did not, taking away from the delightfulness I was planning on having with this beer. I also believe this style isn’t my cup of perfection. I would have it again but there are many other beers from Russian River I would have before this one. Enjoy! Useless Fact: During World War I the punishment for homosexuality in the French army was execution. If the offender was an officer he was allowed a final charge against the enemy on the understanding that he would get himself shot. Every time I have a beer from Russian River Brewing Company I comment on how wonderful each an every beer seems to be. You might be tired of this now, especially if you cannot get their beers or haven’t had them. I don’t live anywhere near the brewery and usually get my fix from my cousin who lives out in California. 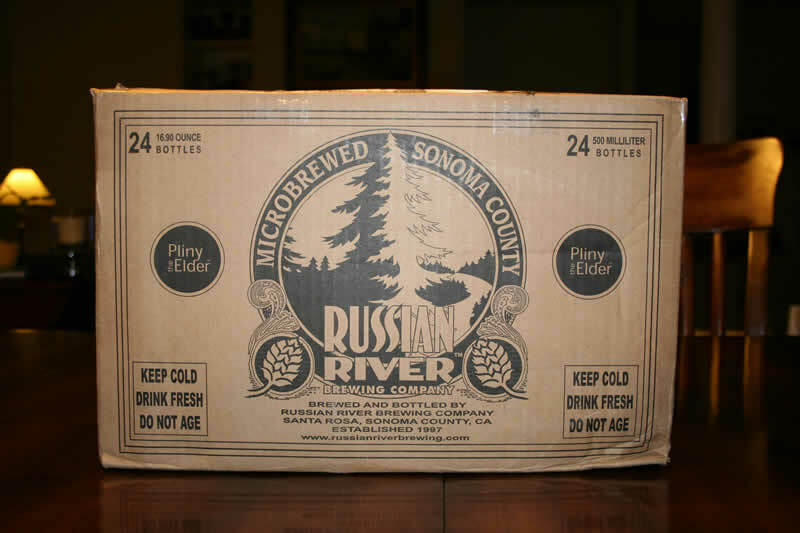 It could quite possibly be the fact that the difficulty at which I go through to get their beers makes them taste better but, based on what other reviews I see on the web, Russian River just makes damn good beer. Supplication donned my glass the third time overall. Each time I have this beer I wonder at how well balanced. The sour is there but let’s all the other flavors come through and doesn’t make me clench my fists with each sip. Last night I actually marveled at how easy it went down with the sour seeming to draw me in each time. I haven’t had a ton of sours but Supplication could easy be my favorite. Balance, drinkability, and overall enjoyment all aid in this opinion. Enjoy! Useless Fact: There is 1 mile of railroad track in Belgium for every 1 and a half square miles of land. If you are anything like me than you look forward to just about any American craft beer that comes out of Russian River Brewing Company. Of course the Midwest doesn’t see these beers by way of normal distribution possibly altering our mindset into appreciating these beers much more than they should but I think it is general consensus among beer geeks that Russian River makes some quality brews. This time around Sanctification was the flavor of the day. Sanctification is bottled aged with brett to give it a tart flavor and aroma. The tartness isn’t as over the top as expected based on what I read on the bottle. Instead it was a subtle complexity that added perfectly to the beer. 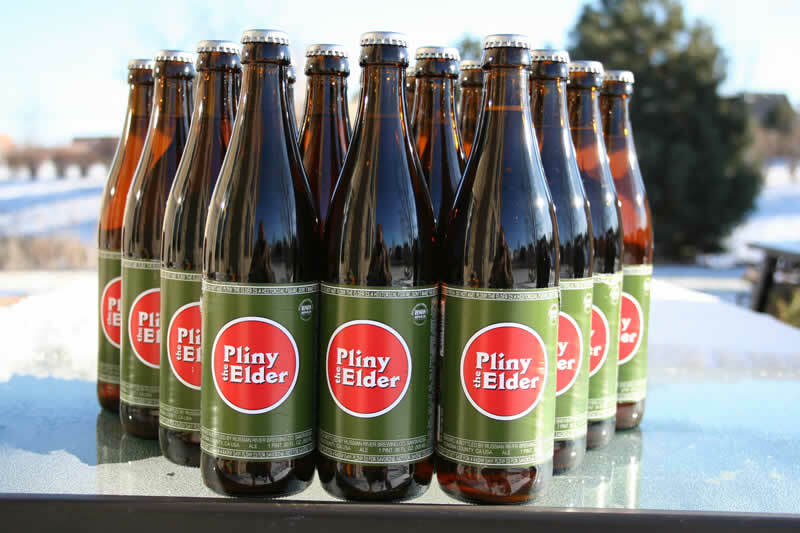 Cheers to one day having Russian River beers more easily accessible. Until then, my cousin Russ will continue to be on speed dial. Enjoy! Useless Fact: The world consumes more than 1 billion gallon of petroleum a day. American craft beer is always best when shared with other enthusiasts. Discussing each beer and nuances is about probably the best part of this hobby for me. Tuesday Night Beer Club (TNBC) probably had the biggest turn out of beer last night in the neighborhood of 25 beers sat on the counter for choice chance of being chosen one of the few. 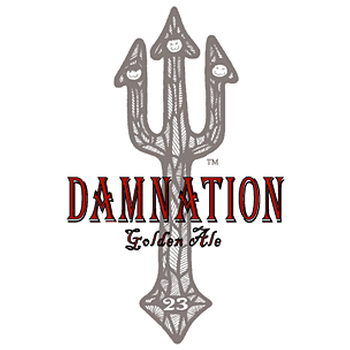 Out of the rubble of the six beers that I had a chance to appreciate, I chose Damnation by Russian River as my beer of the day. I would say that I actually liked 2 Turtle Doves by The Bruery a bit more but I only had one bottle of Damnation, so it wins because I don’t have the chance to go in the cellar and have it again. Damnation easily becomes one of my favorite Russian River beers. The complex subtleties all play well together and none really steals the show but shares the time on the palate, letting each come through nicely. 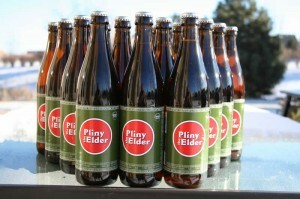 I have to figure out a way to get and spend a day at Russian River. Anyone want to sponsor my trip? Enjoy! Useless Fact: The Amazon River discharges 4.2 million cubic feet of water per second in the Atlantic Ocean. 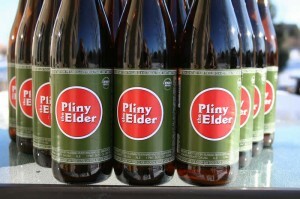 American craft beer at its’ finest: Pliny the Elder (PtE) by Russian River Brewing Company. Before my first PtE, I had heard great things about, especially how wonderful this beer was wile it could quite possibly be the best DIPA in the United States. Once you start getting into American craft beers, these type accusations peak your interest. I was fortunate to land this beer handful of times in 2010, never securing more than two at a time. Once obtaining, tasting, and reviewing, I quickly became a believer that PtE is, if it isn’t the best, in the team photo for best DIPA. Occasionally I have received some PtE from my cousin whom lives in southern California but it was sporadic at best. A week ago he informs me that he has a basketball tournament in Norther California and wants to stop at that brewery I am always telling him about. Yeah, must be the life. The next thing I know I am getting a phone call stating that he has secured an entire case of PtE!!! Holy crap Batman. One of his fellow coaches wanted six of the eighteen beers, which was fine with me. I had 18 PtE en route. Yum! If you have the capacity to get this beer, do yourself a favor and obtain it. You may not agree that it is the best DIPA in the land, but there is no denying that it is in the top five and, for a DIPA, is one damn easy drinking IPA. Enjoy! Useless Fact: Reindeer milk has more fat than cow milk.